Before you go... How About We Split The Payment For ALL 90+ Back Issues Into 2 smaller and easier to manage payments? This way you get access to everything today and can fund the balance out of your future earnings. This PLR Is So Good You Can Monetize It Faster Than Usain Bolt Could Run The 100 Meters! Now, I'm not going to claim that the Internet Marketing Newsletter is highbrow - it's not! In fact English teachers would probably hate it and that's good with me. Because the readers and online marketers everywhere LOVE it! Every month they look forward to sitting down with a pot of coffee and devouring the 50 page Internet Marketing Newsletter like they would the Sunday papers. And the Internet Marketing Newsletter does something ordinary publications don't do - it teaches real methods for making real money online. 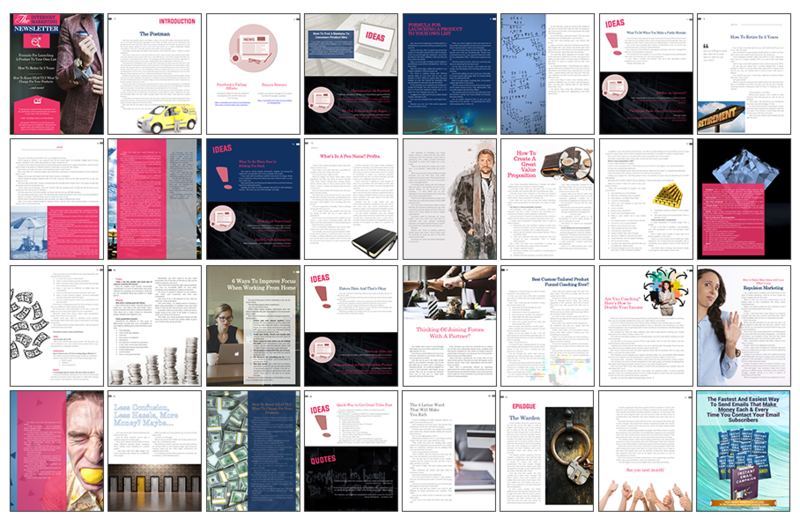 It also gives all the latest online marketing news, resources, clever ideas and more in every single issue. Readers LOVE the Internet Marketing Newsletter! "Let's face it you know it and I know it... Most PLR you get offered online these days is pure crap which is why I've tended to stay away from it. However, every once in a while you make a discovery and find a source of PLR that reminds you of what licensing was originally meant to be about. The ability to re-publish someone else's brilliant content and put your name as the author and generally making life EASIER for yourself. Finding PLR opportunities like what Nick has here is rare... However what's even unique about this monthly PLR service is that it's being created by someone that's got over 15+ years full-time IM experience (not some ghostwriter from a far flung corner of the planet). Heck this guy even fought off 200+ other marketers in my Mastermind Group and won the coveted Internet Marketer Of The Year just recently. So rest assured that whatever he's writing about comes from his first hand experience having worked in IM for almost as long as me. His PLR service is highly recommended"
Content that I originally wrote exclusively for my own personal $40/month subscribers and never intended to release the Private Label Rights to. Be prepared: People may think you spent weeks and months writing it yourself. In either case, you and your audience are going to LOVE IT! Below you'll see just some of the topics and ideas in just a small handful of the recent back issues. Frankly, we simply don't have the time to go back and pour through every issue because there's simply too much great content packed into every single one. So we randomly pulled out several of the volumes and made this list so you, so you can get an idea of the high caliber of content we're talking about. this isn't just fluff, this is great stuff you readers want to know, as you're about to see for yourself. The Exact Product Creation Outline You Can Use To Develop Any Product From Start To Finish In One Afternoon. How To Stop The Customer From Asking Should They Buy Your Product And Instead Ask HOW MUCH They Should Buy From You. Nick gets straight to the point, providing the exact steps he takes in own business, showing the way to make an additional six figures per year. 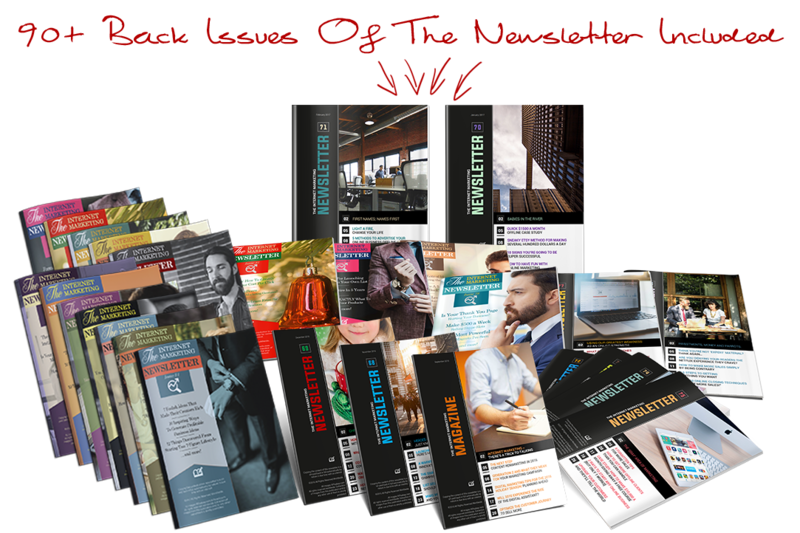 The Internet Marketing Newsletter is the BEST internet marketing magazine available on the internet (YES it is the Best). Working with Nick and his team and having the ability to use the Internet marketing newsletter allows you to position yourself as an authority instantly. By providing this to your client base and your niche as the editor and producer of your own magazine is powerful. I highly recommend using this tool to help market and position yourself as that authority in your marketplace. How To Get Radical Results In Your Online Business FAST! "licensing another coaches content can be so useful. Its saves so much time"
As a coach I know how long it takes to write my newsletter and blog content... and here’s what winds up happening: I don’t do as good as a job as I’d like, or I pay too, much to outsource or I don’t do it. Then, my sales suffer, I fall out of touch with my current clients, and overall, I feel worse. Here’s the challenge with licensing other people’s material: it could be either really bad or not look good or just not fit. That’s why I love that I found Nick’s stuff! The content is top rate, it’s quality work-and, while this might not sound important at first - I think it is super important - the material LOOKS great. Often your client will not read all of what you’ve sent, but there’ll skim it, and if it looks good they’ll have the perception that you’re sending quality, valuable information. So, combine the great looks with quality content and you’ll have something you’re proud to send and your clothes will appreciate - which results in higher sales, greater retention rates and you’ll feel better knowing you’ve delivered! Obviously This Is A Ton Of Great Online Marketing Content, And It's 100% Ready You Make You Money! And remember, that list only represents a small portion - about just 5% - of what you'll find inside these 60 issues. Every issue is packed with Articles, Ideas, Resources and News along with an Introduction and Epilogue. Reuse The Content Almost Anyway You Like - After All , You've Got Full PLR Rights To It! The one thing we ask you to never ever do is make the 'source files' of the PLR Newsletter available to anyone else or license the PLR on to anyone else. This is because we want to maintain the integrity and value of the material for all concerned. (Though we do offer an affiliate program should you wish to promote our newsletter writing service to your customers). Choose and Add the title of your magazine together with your own name. You get Private Label Rights Use your newly written content to create new E-books, eCourses, Podcasts, Radio Shows, Videos Etc. 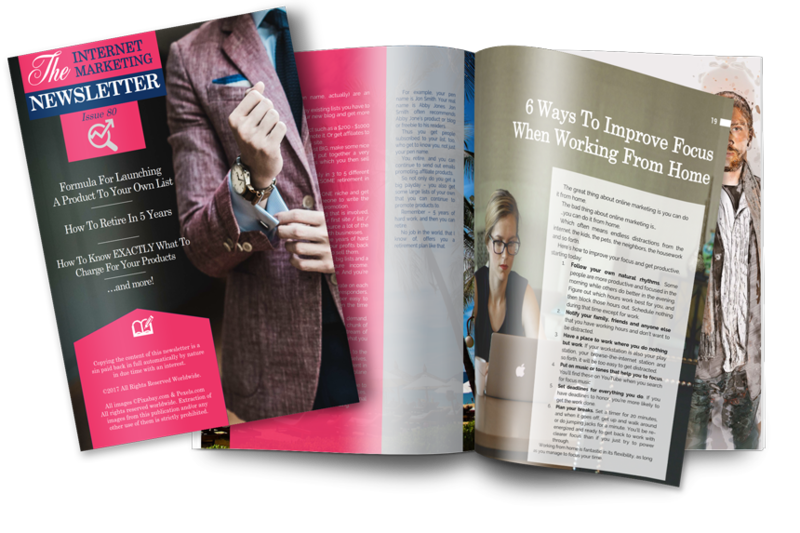 You'll also receive A Professionally Designed Template in Word Doc (.doc) format, just open it, add your newsletter title and your own name and run your own PRINTED and/or online magazine. And remember you also get a 'ready to be distributed' PDF ILLUSTRATED newsletter full of the monthly content, so you can deliver it AS IS to your subscribers. Finally you can FOCUS On More Important Aspects Of Building Your Business Instead Of Struggling To Create Outstanding Content! At least that's how I always thought it should be done. It's probably the first one I've ever read from beginning to end (besides my own of course). rest of those who *play* on the Internet Marketing arena.